FS2 is a water-based, post-treatment, interior/exterior fire retardant, and wood preservative that penetrates the material and bonds with the cellular structure. FS2 contains polymers that maintain the fire retardation for up to five years for exterior applications. FS2 protects exterior and interior woods such as: porous woods, cedar shake shingles, decking, and structural lumber. ASTM E-84, NFPA 255, UL 723.Comes with documentation for fire marshal. Flame Stop II is a water-based, post-treatment, interior/exterior fire retardant, and wood preservative that penetrates the material and bonds with the cellular structure. The penetrant protects the substrate by developing a self-extinguishing reaction when the treated material comes in contact with an open flame. When properly applied on certain untreated woods such as Douglas fir, the wood shall have a Class A rating. Flame Stop II contains polymers that maintain the fire retardation for up to five years for exterior applications. It is non-toxic, non-combustible, non-carcinogenic, easy to apply, and contains no PDBE's. Flame Stop II protects exterior and interior woods such as: porous woods, cedar shake shingles, decking, and structural lumber. Flame Stop II is a Class A, one-coat system with a Flame Spread of 25 and Smoke Developed of 25 on Douglas fir. Coverage rate is 125 sq ft per gallon. Since this product penetrates and forms a molecular bond with the substrate, the life of the flame retardation shall be indefinite for most interior applications. For exterior applications, it is recommended that the Flame Stop II be reapplied after five years. It will not alter the structural integrity of wood, such as pressure treatment does, and is preferred, because it is user-friendly, functions as a wood preservative, dries clear, and can be easily applied by spraying, immersing, brushing, or rolling. 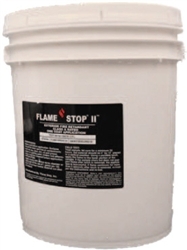 Flame Stop II contains mold and mildew inhibitors which are effective against black mold. Once cured for 48 hours, the treated material may be painted with most latex-based paints. Copyright © 2014 RDR Technologies. All Rights Reserved. Ecommerce Software by Volusion.